Are tennis balls yellow or green? With his world-record 20 grand slam tennis championships, it’s likely few people on earth have spent more time looking at tennis balls than Roger Federer. He’s also backed up by the International Tennis Federation which has required all tennis balls be “yellow” in color for the last 46 years. Case closed, team yellow for the win right? Despite this overwhelming evidence in favor of yellow we still weren’t totally convinced. Reminiscent of the 2015 dress color controversy, Federer’s comment had Twitter users questioning reality. It turns out a large chunk of the population are totally shocked that tennis balls might be considered anything but green. It’s understandable that Twitter users might be so passionate about this issue. After all, it can be a bit mind bending to think that much of the rest of the world sees such a common object as a completely different color. Before we answer the question, we need to define the colors yellow and green so we know what we are looking for. There is broad agreement that humans perceive wavelengths of light from 520 to 560 nanometers as “green” and 560 to 590 nanometers as “yellow”. According to our Physics textbook, “Fundamentals of Atmospheric Radiation,” the color green is defined as 520-560nm and yellow as 560nm-590nm. These two colors are right on top of each other so, right away, it’s easy to see why there might be some confusion here. Measurement of light reflected from our tennis ball shows that the color is really green and yellow (or chartreuse). Shaded green and yellow regions represent generally accepted wavelength ranges for those colors. Our original question turns out to be sort of a trick question. Tennis balls are neither green or yellow, they’re actually both green and yellow! Looking at the data above, our tennis ball has a definite peak of reflected light at 525nm. 525nm is squarely in the green range but we would expect a pure green to have a bit more defined peak. Since we also see a significant amount of energy in the yellow range, a more accurate description of this tennis ball’s color might be “chartreuse” (link: https://en.wikipedia.org/wiki/Chartreuse_(color)) which lies right between green and yellow. Why do so many people see tennis balls as either green or yellow? The colors we see are determined by three things: the physical color of light reflected by an object, the physiological, electrochemical process of the eye to convert that light into an electrical impulse and the psychological, the processing the brain does to create an image from that signal. We already measured the physical component so it’s the last piece, the psychological that we’re most interested in in understanding why we might disagree about an object’s color. Seeing is not passive. Our brains add meaning to the light that our eyes detect based on context and experience and memory. We are continuously and actively re-visualizing and color-correcting the signal that comes out of our retinas. One of the ways our collective brains may be influenced is by the appearance of tennis balls on TV. If tennis balls appear more yellow or more green on TV, that could shift our perception of the color. To find out if this might be a factor, we plotted our tennis ball into the CIE 1976 color space so we could compare it to a standard TV color gamut (if you’re not familiar with these charts, check out our primer on chromaticity diagrams). Here we see that the tennis ball is a very saturated color that lies right between green and yellow. It’s also interesting that our tennis ball is right on the edge of the BT.709 color gamut used in HDTV broadcast. In fact, if we take a closer look at the zoomed-in chart on the right, the tennis ball is just outside the range of colors used by HDTVs. Displays cannot simply recreate the exact spectra of light reflected off of a tennis ball that we measured above because displays create color through a totally different process called additive mixing. Displays mix just three primary colors of light (red, green and blue) to recreate millions of colors. In the case of a tennis ball, a display essentially tricks our eyes into seeing chartreuse, by mixing together red and green light. The quality of chartreuse that a display can reproduce is therefore determined by the quality of red and green light a display can reproduce. Since the tennis ball falls outside the primary colors of the HDTV broadcast signal, this means that the color of a tennis ball is essentially impossible to accurately reproduce on a standard HDTV. Additionally, most HDTVs would not have the correct red and green to recreate our exact shade of chartreuse. As a result, the actual color that most TV viewers experience is based more on the creative decisions of broadcast crews and the color gamut mapping algorithm of their TV, which may be shifting the color more towards yellow. If that’s the case, it would help explain why so many of us perceive tennis balls as yellow. That’s because they are yellow when they mean the most to us, which is on TV during an important match. This doesn’t quite explain Federer’s perception. Although it is quite possible that he’s watched enough endless hours of film working to improve his game, which he likely cares deeply about, to have shifted his view towards yellow. It will be interesting to see if our collective tennis ball color perception begins to shift towards green or chartreuse as more and more people adopt UltraHD TVs with wide color gamut capabilities. *: Note that we chose to use a Wilson ball since it’s the official ball of the US Open and we’re based in the US. As a future experiment, it might be interesting to test the ball used at other events like Wimbledon to see if there’s any international variance in color. Special thanks to Ernie Lee and Brian Mui! 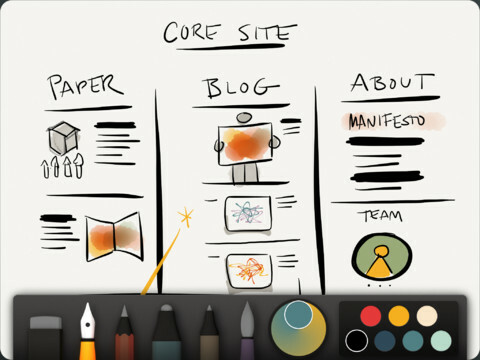 App developer FiftyThree recently updated one of my favorite creativity apps for iOS, Paper, with an impressive new color-related feature. If you are not familiar with Paper, it’s a sketchbook app capable of making the work of even non-artists like me look gallery worthy with an intuitive and responsive interface. The new feature, which FiftyThree calls “the biggest leap forward in color controls in the past 40 years,” is a color mixer that allows you to create a wide array of colors within the app just as you would in real life. They say they put a lot of time and effort into making the new mixer feel natural. The Paper color mixer works just like finger painting as a kid, mixing yellow and blue in the Paper app mixer produces green. The new color mixer, shown at the bottom of this screenshot, lets you mix multiple colors to achieve a much wider palette in the new version of Paper. This is a great feature that expands the content creation capabilities of an already exceptional app. But, as great as this app is, it’s still limited by the color capability of the device it’s installed on. Even the latest iPad, which can produce 100% of the sRGB color gamut, still only shows about 1/3 of the visible color spectrum. The experience you will have mixing and creating colors on today’s tablets just will not be nearly as dynamic or visceral as making a physical painting. Not until better, wide color gamut technology is adopted in displays will the digital color experience match the stunning world of color we live in.